The following hotels are mostly budget style, bed and breakfast style, or boutique accommodations. Some are in need of refurbishment, hence the low rates, but are clean, safe and comfortable. Most buildings are historically listed and are 3 or 4 floors high. Few have lifts. Reservations: Berma Hotel is difficult to get a reservation directly - we recommend reserving online by clicking here. The Bema Hotel enjoys a very special position in one of Amsterdam's most beautiful neighborhoods, in the heart of cultural Amsterdam. The hotel is situated opposite the Concertgebouw, close to the Van Gogh Museum, Rijksmuseum and Stedelijk museum. This tiny property is a gem in the heart of the city and the friendly and welcoming multicultural staff will make every effort to make your stay (which includes breakfast) unforgettable. Most rooms have a private shower, some also feature an in-room toilet. Apartments are also available with Internet access, bathroom, TV, Kitchenette and more. Average rate per night: 70.00 EUR (As of 12/26/05). This comfortable three star hotel is located in ten fine monumental houses dating back to the 18th century. Hotel Terminus is ideally situated in the historical and exciting heart of Amsterdam, next to the Berlage Trade Exchange, Central Station, Dam Square, the canalboats on the Damrak and De Bijenkorf. The hotel is also situated near Amsterdam's finest shopping areas like the Kalverstraat and the Nieuwendijk. Also close to the hotel is the fleamarket on the Waterlooplein and the flowermarket near the Munttower. Hotel Terminus offers 93 elegantly furnished rooms, varying from standard rooms to more luxurious rooms. All rooms are equipped with modern facilities: Television, direct dial telephone, shower/bath and a hairdryer. There is also a restaurant and a spacious lobby with a pleasant bar. Average rate per night: 100.00 EUR (As of 12/26/05). Situated in the heart of the City Centre adjacent to temple Bar, within walking distance of all major theatres, museums, restaurants, shopping areas, Trinity College and O'Connell Street. All 27 en suite bedrooms are tastefully decorated, some of them are overlooking the River Liffey. All rooms have tea/coffee making facilities, direct dial telephone, television and hairdryers. Average Rate Per night: €100.00 (As of 12/26/05). Located in Dublin city center, the Castle Hotel is a friendly, safe, secure and comfortable home away from home. Widely known as one of Dublin's oldest hotels, continuously operating since 1809, The Castle Hotel is an elegant and spacious Georgian hotel, offering value for your money. The Castle Hotel is within minutes of all of the city's major attractions and is actually located on Dublin's official cultural trail. The Castle Hotel offers immediate access to the Abbey, Gate & O'Reilly Theatres, Hugh Lane Gallery, the Francis Bacon Exhibition the Dublin's Writers Museum, the James Joyce Cultural Centre and much more. The Castle Hotel is within walking distance of Temple Bar, and within minutes of Arnotts (the largest department store in Ireland) & Cleary's shopping centres. The Castle Hotel retains many of its original Georgian features, such as splendid period staircases, original plasterwork, striking antique mirrors, crystal chandeliers and open fires in the winter. Average Rate Per night: €110.00 (As of 12/26/05). The River House is located in the heart of the city's colorful and exciting Temple Bar area and makes it an ideal base when visiting Dublin. Dublin Castle, Christchurch, Guinness Brewery and Trinity College are just some of the premier tourist attractions within minutes from the hotel. The River House has its own bar called The Mezz, considered Dublin's premier live jazz and blues café venue, where food is served daily until 10pm. It also offers an excellent nightclub called The Hub, which has become one of Ireland's most innovative live music and nightclub venues. All of the rooms are tastefully decorated in a contemporary style, with television, radio, hair dryer and direct dial telephone. Average Rate Per night: €90.00 (As of 12/26/05). A warm welcome awaits you at Waltons Hotel. Situated in the heart of Dublin and only 1 minute on foot from O'Connell Street, Waltons Hotel offers an enjoyable stay at a modest cost for the tourist and business traveler alike. The hotel overlooks Findlaters magnificent 19th Century church and 20th Century Rotunda Hospital and is within walking distance of all of Dublin's major tourist attractions. Cultural, historical & entertainment hubs are only moments away from Waltons Hotel. Average Rate Per night: €65.00 (As of 12/26/05). The Saba Hotel is situated in the historical center of Istanbul, right in the old city and close to the Blue Mosque, St Sophia, Peninsula, Topkapi Palace and the Hippodrome. Converted from a 19th-century Ottoman-style wooden house, it's now an architecturally modern hotel with 27 rooms, three of them with a balcony and all equipped with cable TV, telephone, minibar, safe box, air-conditioning and hairdryer. Breakfast is specially prepared by the staff with home-made preserves and delicious Turkish cheeses, in the spirit of the traditional Ottoman breakfast. Guests can benefit from the fitness room, Jacuzzi and sauna. Panoramic views of the Bosphorus and the Sultanahmet area are available from the hotel terrace. Average Rate Per night: €90.00 (As of 12/26/05). The Georgian House is a charming hotel located in the center of London. Built in 1851, it is still run by the original family. This independent hotel offers a high standard of central London bed and breakfast accommodation, with an emphasis on comfort and warm service at a cheap and affordable price. The hotel, close to Victoria Station, is ideally situated for access to all of London, yet has the advantage of being just outside the congestion zone. All the main attractions of the city are within easy reach; a short walk to the King's Road, the Chelsea Flower Show, and the Hard Rock Café. The hotel is near Big Ben and Buckingham Palace, and very convenient for shopping in Oxford Street or Knightsbridge and Harrods. The accommodations are provided in two buildings, with the main reception in St George's Drive. There is a second small and pretty building, The Bower House in Cambridge Street adjacent, where the first class rooms are luxuriously furnished. The rooms are beautifully decorated in keeping with tradition, yet offer the warmth and comfort expected by the modern traveler. Average rate per night: £65.00 (As of 12/26/05). 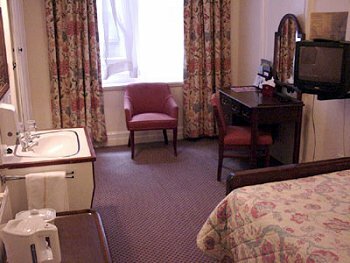 The Monarch Hotel is a good quality friendly budget hotel close to Earls Court tube station. It is situated near the Natural History Museum and the Royal Albert Hall and has an ideal Central London position. The Monarch is a short walk to either Gloucester Road or Earls Court underground stations (Piccadilly, Circle and District lines). It has easy access to Heathrow Airport and Central London and many bus routes serve the area. Perfect for budget travelers, students and all those very keen to save on basic accommodations in return for extra spending money in the city of London. The Monarch Hotel has single, double and triple rooms available and they have recently been refurbished to the highest standard. They all come with an en-suite shower & wc,a color TV and a telephone. A full English breakfast is included and served every day. Rates are from £45.00 per room per night. (Rates last updated 2/11/05). Boasting a prime location and unbeatable prices, the Regent Palace is easily one of the best value lodgings in London. Within minutes of entertainment, fine dining and shopping venues, the hotel is attractive to both business and leisure guests seeking the ultimate bargain. Accommodations all consist of color TV, direct dial telephone and wash basin. Of the 888 rooms within the hotel, 385 have their own en-suite bathroom. Within the hotel, there is also a convenience store, Café Antonios, Callaghan's Irish Bar and Harry Ramsdens Fish and Chips Restaurant. Average rate per night: £89.00 (As of 12/26/05). Situated in beautiful Paris, the lovely Best Western Aramis Saint Germain hotel is ideally positioned between Saint Germain-des- Pres and Montparnasse. This Best Western hotel is also within easy reach of several Paris attractions such as the Eiffel Tower and Notre Dame. The Best Western Aramis Saint-Germain hotel offers comfortable and stylish accommodation for both the leisure and business traveler. The hotel has modern comfort with antique furniture in a 19th century building. Our hotel offers coffee shop, meeting space to accommodate up to 30 guests and laundry and valet services. The guest rooms are equipped with satellite television with CNN and BBC, , telephone with dataports, mini-bar, coffee/tea maker and hairdryer. All rooms include bath, shower and water closet. Average rate 140.00 EUR per room per night. (As of 12/26/05). Hotel des Arts is a quiet hotel just a step away from Sacre Coeur and ideally located in the very center of Montmartre between the Place du Tertre and the Moulin Rouge. The hotel's location is in the heart of the Parisian quarter which poets and painters have made so famous. The Hotel des Art offers you the comfort of its 50 rooms, all en suite with bath or shower and WC. The Hotel is Equipped with WI-FI and Wire-less high-speed connection. Rates are from 57.00 EUR per room per night. (As of 12/26/05). The Saint Georges Lafayette is a tourist class hotel located between Montmartre and the Opera and is 25 km from Charles du Gaulle International Airport. The hotel's location is ideal as it places guests in the center of the business and shopping area of Paris. So whether you have come to Paris to work or explore the shops, you are right where you need to be. All of the guest rooms are clean and comfortable and feature modern furnishings and amenities. All of the rooms have been recently renovated and offer private baths, satellite television and direct dial telephones. In the heart of Paris, you will find the hotel to be a great place to relax after exploring the city, and all at a reasonable price. The hotel staff is always available to assist guests and the hotel is convenient to many shopping, dining and entertainment venues. Room rates EUR 49.00 - 66.00 (As of 12/26/05). The Wilson Hotel offers a friendly and relaxing atmosphere in a setting of peaceful surroundings. Right on the city's edge: only 10 minutes from the RER station Paris la Défense, 7 minutes by train from Paris. The Wilson Hotel has 61 rooms equipped with bathtub or shower, toilet, Satellite TV, direct telephone and internet connection. Guests can indulge in the comfort of the attractively refurbished breakfast room and private bar. On fine days, the patio is the perfect invitation to enjoy the buffet-breakfast or just relax over a casual drink. The hotel's convenient location allows you to discover the capital city's numerous treasures and hectic life whilst residing away from the Parisian hustle and bustle! Rates are from €50.00 per room per night. (As of 12/26/05). The information in this article was accurate at the time it was published in January 2006 but we suggest you confirm all details and prices directly with any establishment mentioned. The quality of offerings and services tends to change over time.